DawnArk Mac Screen Recorder is a best screen recorder for the mac user. 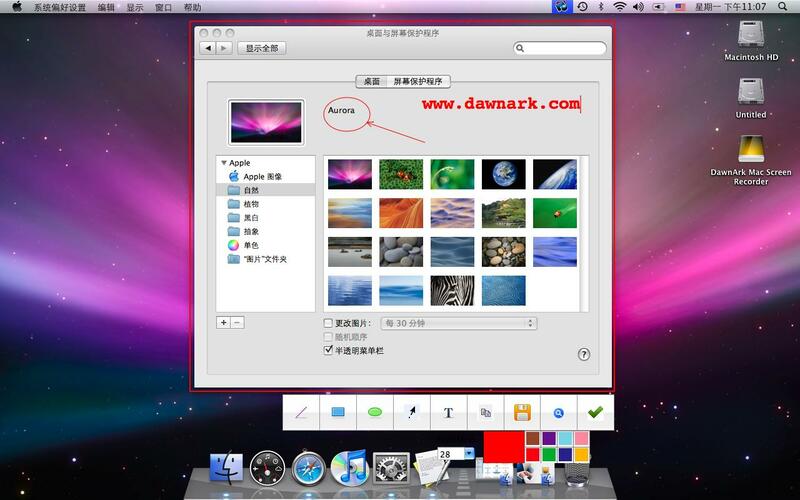 DawnArk Mac Screen Recorder is a best screen recorder for the Mac OS X user. DawnArk Mac Screen Recorder now support recording your screen to MOV and MP4 format. And you can specify many paramerters such as bitrate or resolution to output the movie which you like. To support more format, you can choose DawnArk Mac Video Converter. You can use it to capture a full screen, a selected region. You can draw some simple shape on the capture region. ...... You can draw some simple shape on the capture region. With DawnArk Mac Screen Recorder,you can record hours of screen to show others how to use your software or website. DawnArk Mac Screen Recorder also support hot keys to let your work much easier. DawnArk Mac Screen Recorder can be used for keeping watch over your screen for the software test engineer to catch some bug report or crash infomation while running their software. Qweas is providing links to DawnArk Mac Screen Recorder 3.1.24.0114 as a courtesy, and makes no representations regarding DawnArk Mac Screen Recorder or any other applications or any information related thereto. Any questions, complaints or claims regarding this application DawnArk Mac Screen Recorder 3.1.24.0114 must be directed to the appropriate software vendor. You may click the publisher link of DawnArk Mac Screen Recorder on the top of this page to get more details about the vendor.